As you may know, every Saturday I am going to be sharing with you some sort of student related post which will give some hints and tips to students wherever you are studying! Two weeks ago I asked in my first post what sort of posts some of you would like to see and budgeting as a student was one idea. 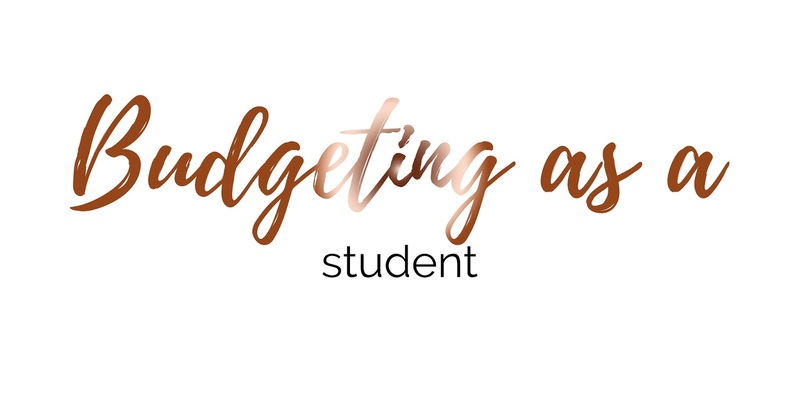 So here we have it; budgeting as a student and my tips to having a budget. I personally do not have to budget as much as other students, but in some cases I do still have too. As I'm living at home, I do not need to pay as much rent as what I would have had to if I was living away from home, but I still have to pay some sort of rent every month. Like many teenagers/20 year olds, I do have a car therefore I have to pay tax, insurance and fuel. Obviously I do not have to pay tax every single month (I mean, I can if I wanted too), but it does mean every six months I'm left with a lot less money because a huge chunk of my wages goes on my tax! Firstly, you need to know how much you're spending each month on bills etc. I'm talking, rent, bills in your flat (if you're in one), food, travel, car insurance? and most importantly, if you're driving then you're going to need to know how much you're spending on fuel every month. Once you've worked this out, take it all away from the amount of money you get each month. You'll then know what you've got left for spending on yourself, going out at the weekend or doing whatever you love to do during each month. Secondly, spend wisely. Do you need something or do you want it? Is it a necessity? Can you live without it? Do you have enough money to not feel poor once you've bought it? Are you going to use whatever it is? Is it going to be a waste of money? Think about all of these questions when you're thinking of buying something, especially if it's near to the end of the month and you literally have nothing left. Thirdly, go for the healthier or even cheaper option. I say this and you're probably thinking "but being unhealthy is cheaper than being healthy" and I know this is true. However, you can still be healthy but go for the cheaper option. Something I like to do when shopping is look at the "price per kg" underneath what the price of the item is. If there's six different types of mayonnaise but one of them is 20p per kg and the one you usually pick up is £1.16 per kg, then pick up the cheaper one instead. Mayonnaise is mayonnaise, brands do not matter! It makes such a difference in the long run once you've gone to the checkout and paid for everything. If you love fruit, salad or vegetables; definitely check out places like Aldi; they're fruit and veg is cheaper than places such as Tesco and Asda. If you're a shopaholic like me, that doesn't stop you from being able to budget; you just need to know how much you have to spend before you've spent too much.